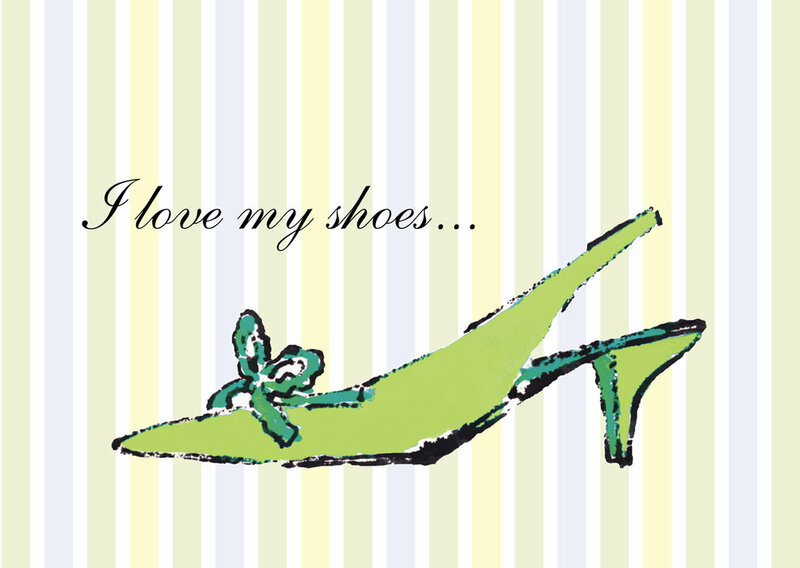 Artform added to Little Note Card Collection—bright and detailed shoe illustrations in a series of wall art posters. The posters featured charming original illustration reproduced on crisp 80lb gloss-finish cover using high quality inks for vibrant, long-lasting colour. The prints were then mounted on foam board ready for hanging. The series included various poster sizes from 5 x 7 inches to 13 x 10 inches. Vintage High-Heeled Boot, Little Black Pump, Kitten Heel and Red Skyscraper Sandal were just some of the poster titles. Feel-good, inspirational thoughts added to the fun and chic shoe art. They were created to be whimsical and cheerful! Prices ranged from $14 to $20. Great Gifts!